We at The Takeout are just a wee obsessed with Guy Fieri, and we say this with 0.00000 irony. Look it all the nice things he’s done. Just this week, he’s helping the Salvation Army serve food to families affected by the Northern California wildfires. So if he wants to open a fried chicken restaurant called Chicken Guy!, just tell us where to drop the free press. 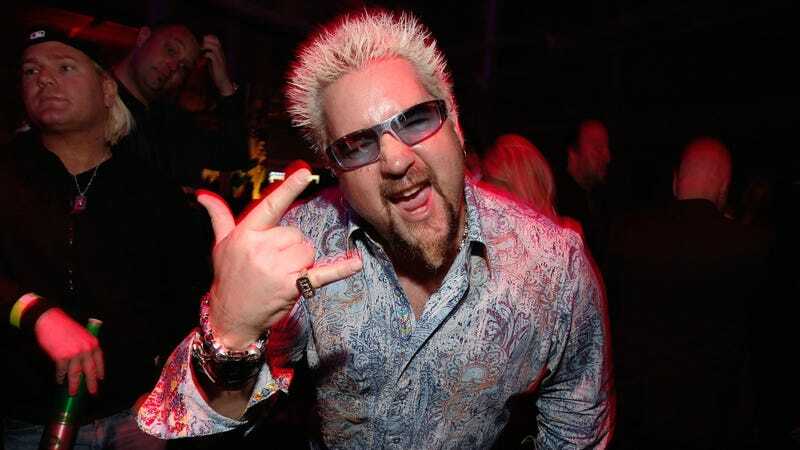 I know the next words coming out of your mouth: Yes, Donkey Sauce is on the menu (mayo + roasted garlic + Worcestershire + lemon + mustard + flames + hell yeah + Whitesnake’s Slip of the Tongue), as are more pedestrian flavors such as garlic parmesan, Buffalo, and lemon pepper. As for the early reviews? DisneyFoodBlog.com enjoyed the “super crispy outside.” Another independent Disney World blog, WDWmagic.com said it featured a “satisfying crunch” and that the sandwiches—which began at $6.49—were “very well put-together, with an above average quantity of filling.” Maybe we need to send Fargo Chicken Tender Critic to review this place? In any case, take a victory lap, Mr. Fieri—you deserve it. Quiz: What do you think happened at Guy Fieri&apos;s Florida restaurant last week?